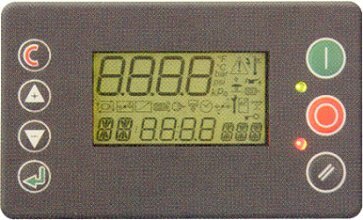 Multi-functional industrial microprocessor control unit (controller AirMaster S1) is designed for the control of operation of air screw compressors. The user interface is equipped with simple and intelligible regulation buttons with the indicator highlighting. The compressor state is vividly displayed onto the liquid crystal display. In the display the symbol system is used which is supported by the text with a choice of the language. The controller is fully compatible with a number of computer systems and can be added by them, providing the effective control, control and analysis. For connecting with other systems the network RS485 is used. As compared with the controller AirMaster P1 the controller AirMaster S1 has a more enhanced function range. at the installation of the additional equipment - remote control of parameters and operation of pneumatic systems consisting of compressors of different models and manufacturers.